Good bye Hong Kong. It’s been a great stay, we will miss you. Hello Beijing, be nice to us, even though we will only stay for a few days. That just to sum up half of the day, where we flew to Beijing. We even got an upgrade to a better airline, since the one we originally booked, canceled the flight. And this is a sincere wish going out to British Airways. Please talk to Air China regarding food, you can learn so much. Best thing would be you to that before we fly back to Germany with you. Thanks in advance. In Beijing we soon discovered a very characteristic thing of the city… smog. 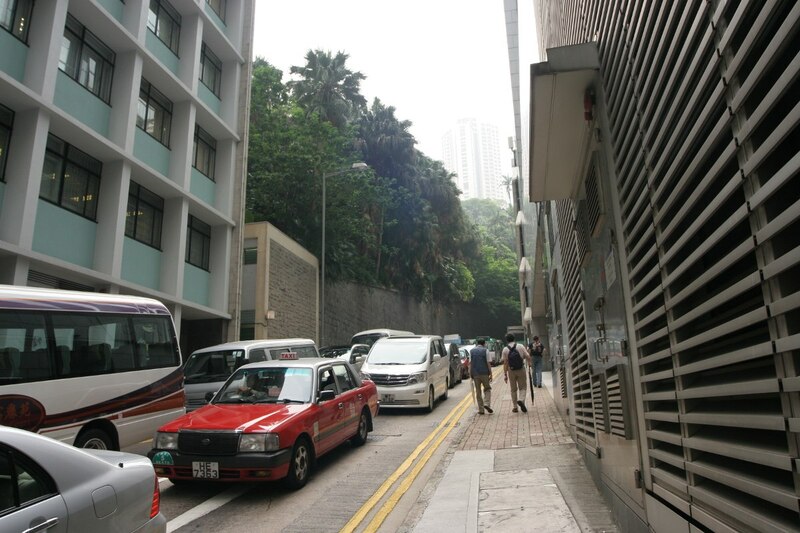 And the area where the taxi driver dropped us wasn’t very reassuring, looked like the most rundown part of the city (at least we thought that it looked like that, not knowing anything else of Beijing). 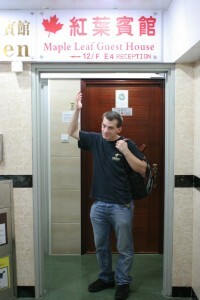 The hostel on the other hand was great. Really a nice place that made us feel like we truly were in China. Very helpful too, since the first things we got along with our room key were a map of the city, as well as a guide for some recommended day trips. I wish every hostel would do that. Great title, we know. On Thursday we went early to the Jade Market. Quite an experience and we never knew that there were so many different kinds of jade. With every deal the experience in haggling grows, but even if you pay about a fourth or fifth of the asking price, you are somewhat sure that the seller is still making a good deal. Then again, coming from Germany, we were doing that as well. But unless one is a jade expert, I’d recommend to not even think about buying one of the finer, more expensive pieces. After that was the trip around the harbour on the Duk Ling junk, which we booked the day before. Well, the junk was quite touristy, so just think of an usual tour ferry made of wood. The weather was still damp, so one couldn’t see the full distance, but still was a nice little trip. We arrived on the “other side”, i.e. Hong Kong Island. Yey, we finally made it. Here you find even more malls, Starbucks and air conditioning. 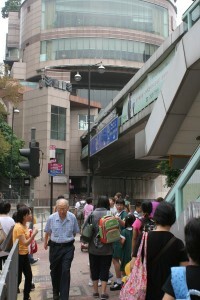 And yes, this is the modern Hong Kong you would usually think of. Exploring the island, we strolled over the flower and the bird market. 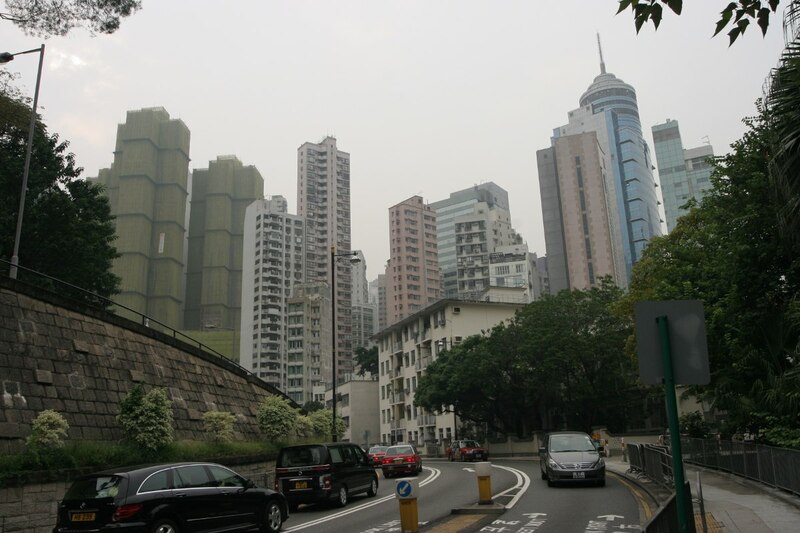 We made a long walk up to the Hong Kong Zoological and Botanical Gardens (which wasn’t that thrilling, since they use double layered fences which block the view and the animals weren’t that active, probably due the weather). Our way back led through the park. Unfortunately we were to late to visit the aviary (which is walkable, unlike the one in the zoo), but still could enjoy our time there. They got a Fighting S.A.R.S. Memorial in the Tai Chi Garden there, to honor those who died in the struggle to fight the disease. And a 105 steps tower which gave us a great view of the area. Some local young artists used this tower as well to make some sketches of the area. 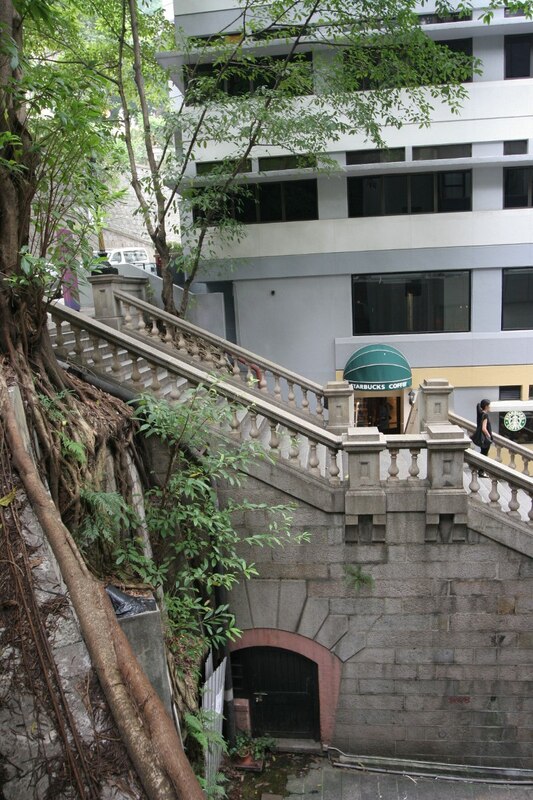 On Wednesdays you can get into most museums in Hong Kong for free. That was a nice start to our visit in HK. We visited the HK Museum of Art, where they have a great collection of classic and modern calligraphy. 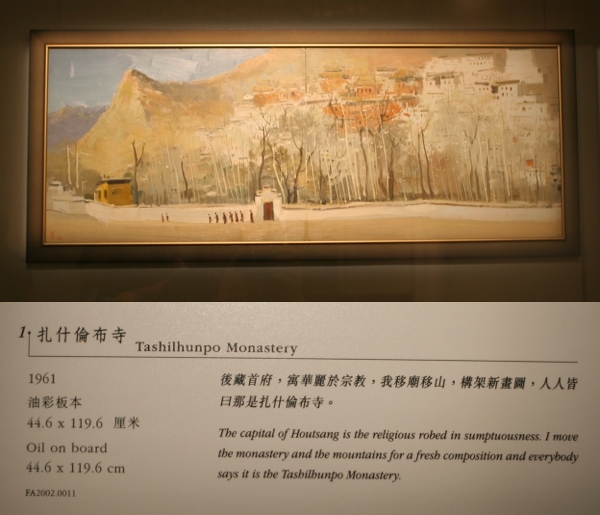 Also there was an exhibition of the late Wu Guanzhong, who was an exceptional Chinese painter. It took a few pictures, but eventually I could adjust my view to the eastern way to analyze a picture. That was quite an interesting experience. To explain that: In western art, you usually analyze a picture from left to right, as this is the way we usually read. So the eye enters the image from the left and searches for an area with high contrast. From there on it usually follows some flows till it gets blocked or finds the area, that the artist originally wanted to show. This is a more or less basic rule to create an image. Once you start looking at pictures like that, it’ll be much more easy to figure out what an image is all about. Of course this is no perfect rule, as many artists don’t know that rule or don’t follow it intentionally. But it helps. You’ll often find that in advertisements, where, for example, the curves of the model direct your view to the product it’s advertising. Anyway, the point I was getting to is, that I couldn’t figure out some pictures of Wu Guanzhong, until I finally remembered how I was viewing the picture and just changed direction to right to left (since this is the way you read classic Chinese, as well as modern Chinese, as long as it’s written from the top to bottom). After that, I could enjoy the art even more. Also, this is the direction one should view an exhibition, especially with calligraphy, since you can the read the plaque first and view the art in the correct direction. In the museum shop they had a large copy of ‘Cranes in Dance’ by this artist. Well, I would’ve needed a few ten thousand HK$ more and some way to get it home, but if I had that I would surely hang it onto my wall… once I get rid of some furniture. Be sure to have a look at some of his paintings. We had our first coffee in HK in the Museum Cafe. Well, that wasn’t something that would interest you, but for us, coffee is important! Next stop was the Tourist Information Center. This was the most vital visit of the whole HK trip, since we got a map of the city here (as already said in another post, a truly epic item). We also book a trip on the Duk Ling junk for the next day. After that, a short visit to the Space Museum, which was nice, but not too thrilling, even for someone who is into the topic. It was targeted too much towards kids and some of the information was a bit outdated. Last thing to do was finding something to eat. Now, that was tough. Not finding something to eat in general, but something we would want to eat. Trying to find a good Chinese restaurant in Kowloon can be quite hard when being in the wrong area. Western style food everywhere, but Chinese? 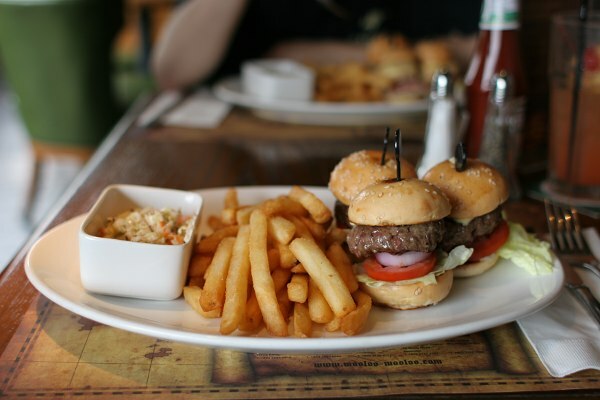 Well, we settled for overpriced mini burgers at McLovin’s Tavern out of desperation. Go us! 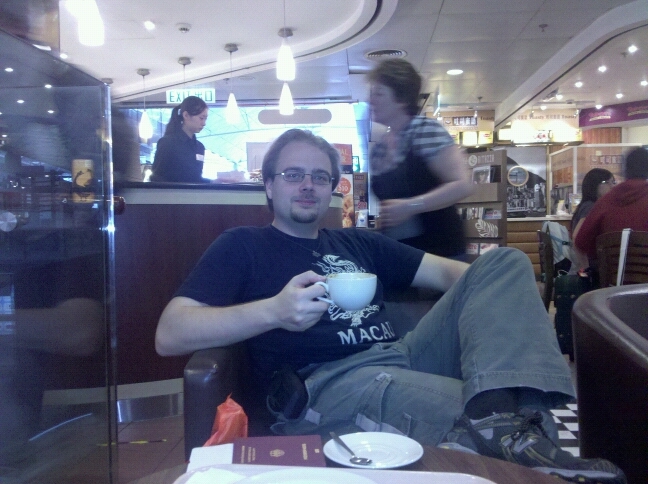 Sitting at HKG, sipping coffee and waiting…. The next time we’ll be killing time like this at an airport will be at the end of our trip in Tokyo (for the rest of the trip we’ll be using taxis, trains and a ferry). 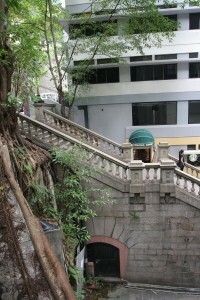 We arrived in Kowloon on late Tuesday afternoon and checked-in into our hostel. After enjoying the air con for a while and checking the Internet (important stuff first) we decided to take a little stroll around the block. It’s not quite what we imagined it to be, almost a bit scary, but quite interesting. Thanks to the culture mix, I guess you could throw in some American metropolis with a middle east urban town, stir around a bit and get Kowloon. But before we continue, let’s talk about weather. Let’s talk about 35-40°C and humidity of 75-90% (depending on where you are). Let’s talk about air conditioning in every store you pass, in every building you enter, in possibly almost every room in Hong Kong, as well as the trains. Then again, we already said enough and you can figure yourself how much of a contrast shower Hong Kong is. And this is not high summer. In July it’s said to be worse. So, while walking through the streets, we got a lot of direct offers regarding tailors, food and foot massages (which is apparently not a code for something different). Every building has a store on the ground level and there’s not a real system here. Exquisite boutiques, money exchangers, food stores, tailors, pot merchants (some of them are big enough to fit in the most of one of us), super markets, electronic stores, they all are to be found everywhere and often enough next to another. And you can’t go for a few blocks without finding Starbucks. Also you can’t go far without stumbling on a mall. Everything amidst people who most likely can’t afford the stuff there. Orientation isn’t really a problem, once you get used to it. 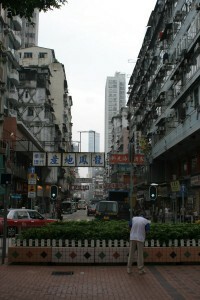 (In other words, our first stroll was a bit of “Lost in Hong Kong”.) You alway find a sign to direct you to a nearby landmark or tourist attraction and once you get a map, you can make use of the street names to find your way with ease. If you even got a compass in your inventory you won’t go into the wrong direction sometimes and can thus go everywhere at full speed. But that’s optional. The map is the most important thing. Truly an epic item handed out by the tourist bureau. Beware of the traffic. The streets are always filled with cars and pedestrians are way down below on the food chain. So, use traffic lights, most times you are safe there. Though, some of the natives don’t care about traffic lights. They cross the street whenever they see a chance. Most likely they developed a special sense for that… or are suicidal… probably both. It’s survival of the fastest. Anyway, it’s better to way till the beeping sound of the lights get faster. This helps people who can’t see good or (which is more common) are busy with their cell phone or newspaper. That’s it for today, stay tuned for till next time. 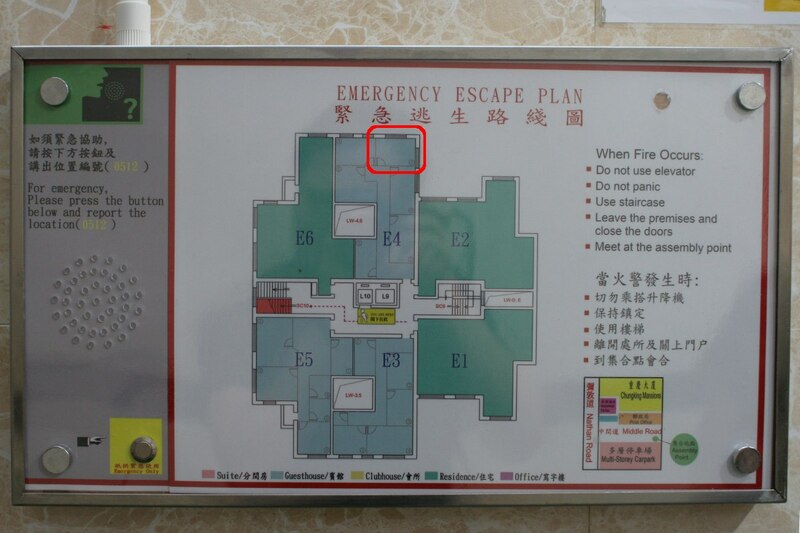 Chung King Mansions consists of five blocks, we’re in block E. Here’s a plan of floor 12, our floor. Our room is marked, so you can follow our way on the map, as well as on the pictures. 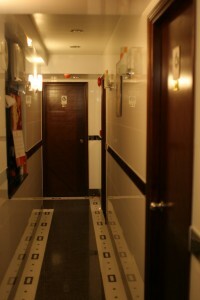 After we leave the elevator again, we see a surprisingly bright and neat hallway directing us to the Maple Leaf Guest House. Room 23, our room. (Hail to all our paranoid friends around the world.) So, how does it look from the inside? Let’s have a look. That’s it? Yes, that’s it. 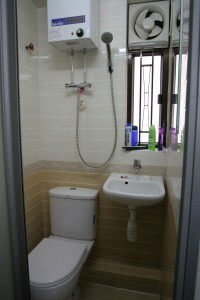 Amazingly clean twin bedroom with a toilet/washing/shower-room (all in one). 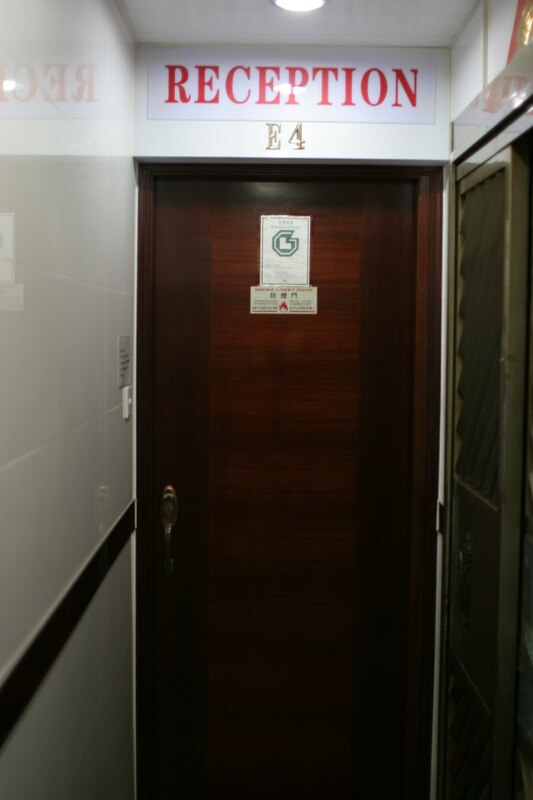 We even got a TV (mostly Chinese), three kinds of air cooling and free hot and cold water in the lobby (well, a part where the corridor is about twice as wide). Fresh towels and prolly some room cleaning every day. Quite nice in here. You just shouldn’t leave the room to destroy that impression… or open the curtains. View outside the windows coming up another time, whenever I get Hugin to stitch those photos. What, we kept you waiting for this post two days? Well, yes. But you know, we’re in Hong Kong. Even computer freaks got better stuff to do here than hang around on the internet all day.